Professor Ho received B.S. and M.S. degrees in chemistry from the California Institute of Technology in 1975 and his Ph.D. in physics from the University of Pennsylvania in 1979. He spent a year at the AT&T Bell Laboratories as a Member of the Technical Staff and was on the faculty of Cornell University prior to joining the UCI faculty in 2000. Our research focuses on nanoscale chemical and physical phenomena with an emphasis on probing the basic properties of single atoms and molecules in their nono-environment on solid surfaces. The goal is to obtain detailed descriptions of single atoms and molecules which form the basis for understanding chemical and physical processes at surfaces and properties of nanostructured condensed matter and molecular materials. The scanning tunneling microscope (STM) is a tool which not only allows us literally to see individual atoms and molecules but also to manipulate and spectroscopically characterize them. It is an all-purpose tool and is in effect a nanoreactor carrying out reactions with atoms and molecules in the nanocavity of the tunnel junction. Since the coupling of electrons to the nuclear motions provides the driving force for chemical transformation, the STM with its tunneling electrons can be tuned to induce atomic and molecular motions and to dissociate and form chemical bonds. Control and Characterization of a Multistep Unimolecular Reaction. Physical Review Letters 2000, 84, 1527. L.J. Lauhon and W. Ho. Electronic Resonance and Symmetry in Single-Molecule Inelastic Electron Tunneling. Physical Review Letters 2000, 85, 1915. J.R. Hahn, H.J. Lee, and W. Ho. Vibrationally-Mediated Negative Defferential Resistance in a Single Molecule. Physical Review Letters 2000, 85, 1918. J. Gaudioso, L.J. Lauhon, and W. Ho. 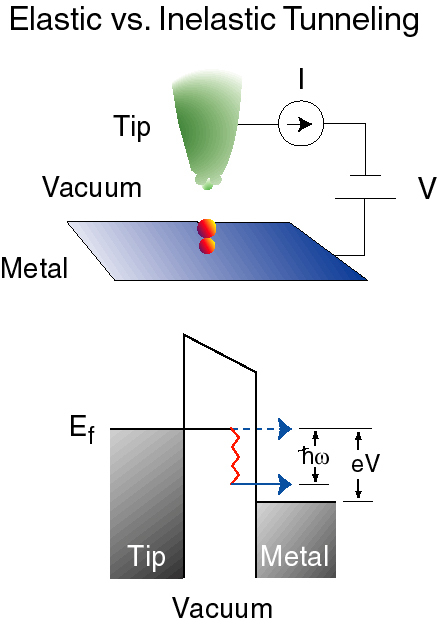 Direct Observation of the Quantum Tunneling of Single Hydrogen Atoms with a Scanning Tunneling Microscope. Physical Review Letters 2000, 85, 4566. L.J. Lauhon and W. Ho. Last modified: Nov 23, 2003.